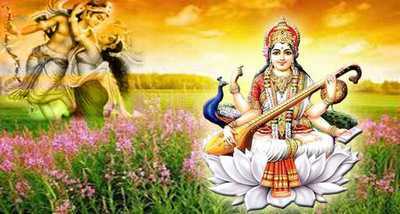 The celebration of Vasant Panchami can be traced back to Dwapara yuga. As per the authority of scriptures like Srimad Bhagwatam and other Vaishnava scriptures, the transcendental Vasant ras lila took place on this night on the Govardhan hill. The place came to be known as Chandra sarovar. It is also mentioned that Lord Chandradev stood still for one night of Brahma to take darshan of this divine dance of Sri Krishna and his beloved gopis, headed by Srimati Radharani. The goddess of learning Saraswati, the divine consort of the Supreme Lord, said thus to Brahma who saw nothing but gloom in all directions, After Lord Brahma was guided by Devi Saraswati, he began to meditate and gain spiritual insights. For thousands of years and as per the traditions and customs prevalent, people have been celebrating this day by observing a fast, decorating the deity of Saraswati with garlands and white clothes and offering her yellow items. The term Vasant Panchami is a misnomer since Vasant Panchami has no relation with Vasant ritu. It falls in the month of Magha, which is a month of Shishir ritu but since the sun has gone in the northern hemisphere, there is warmth which is a symbol of spring season.